Into the woods…off to find a body. The Forest is a brilliant example of January’s reputation as a movie graveyard. Banking on its ability to over-utilize the cliche jump-scare to get a heightened emotional response from the audience, this film demonstrates little uniqueness in this sub-genre of horror; however, I gotta give it a little credit. It was successful in causing me to jump in my seat a few times and even cringe a little. If for no there reason, this film will possibly prompt you to lookup the legends of the Aokigahara Forest, surrounding the foothills and floor of famed and picturesque Mount Fuji in Japan. Starting off as a movie that feels as if it will have a slow burn but then pick up in the second and third acts, The Forest is more like an annoyingly dripping faucet that has a perpetual clog that you wish would eventually explode with excitement. There is definitely a sense of anticipation and anxiousness, but the movie fails to provide a thrilling release. The only intriguing element of the movie is that this fictional story is indirectly connected to true stories of the Aokigahara Forest. Unfortunately, the stories of people going into the forest with the intent to either commit or contemplate suicide is all too true. Furthermore, a friend of mine who lives in Japan told me that the forest really does seem to have a mystical power that compels people to harm themselves or others. Interesting. If you ever visit Aokigahara Forest, be sure to stay on the path and never remain in the forest after dark. 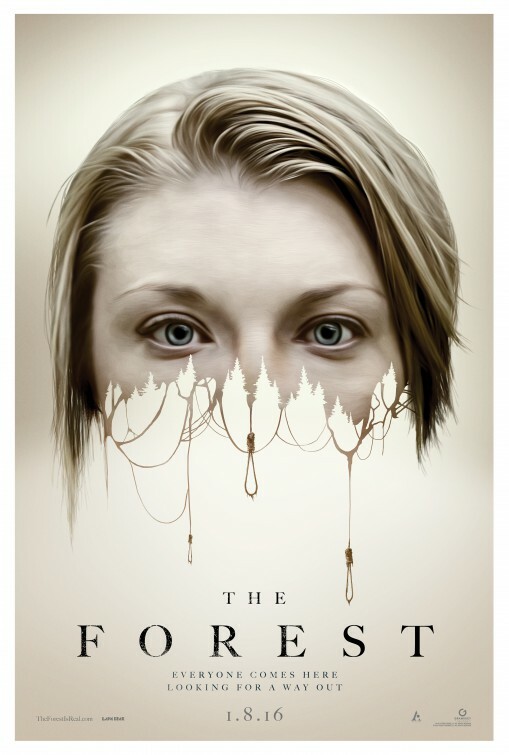 The Forest is about a young American woman named Sara (Natalie Dormer) who senses something has terribly befallen her identical twin sister Jessica. With the intent on finding her sister, Sara flies to Japan and begins to investigate the whereabouts of Jessica. Learning of the legends surrounding the mystical Aokigahara Forest at the base of Mount Fuji, Sara starts to develop a plan to rescue her. Unfortunately, the reputation of the forest scares the locals so much that she is unable to find anyone to help her. Just when all hope is nearly lost, Sara meets local Austrailian travel expert and writer Aiden (Taylor Kinney) and he contacts his guide friend Michi (Yukiyoshi Ozawa) to lead them into the dark and twisted pathways of the forest. Against the recommendation of locals and Michi, Sara and Aiden remain in the forest after dark to find Jessica, but they have no idea that they are about to encounter the tormented souls of those who are looking to add to their numbers. The characters aren’t the only ones who stray from the pathway, the film itself strays from the pathway of a well-paced and developed plot. I am not sure if the movie is supposed to be self-reflexive in that it is about exploring dark, repressed memories that subconsciously torment the soul or if it supposed to be a superficial cliche horror flick that provides an hour and a half of mild to moderate entertainment. From poorly written dialog to including too many poorly placed flashbacks, this film is all over the place. I have often commented on my dislike for films that rely on flashbacks to support or tell the story. Every once in a while, there come films that actually utilize the flashback in a way that works extremely well–but those are few and far between–this is definitely not one of them. The first several minutes of the film feels like a ping pong match because the audience is constantly tossed back and forth between present day and 20-30 year old flashbacks. I feel strongly that this is a horror film that could have really used much more character development for Sarah. Not that horror films are the place to find development amongst its lead characters, but the story being told here was actually a good platform for integrating that element into the narrative. It’s almost like the writers were going that direction, but failed to see it through. Films like this one are not produced to add to the artistic medium of visual storytelling or offer up any degree of legitimate critical value, but still these types of horror films should continue to the library of other horror films by adding something new–even a small contribution. That being said, the fact that the film does integrate true elements of local folklore and true stories of suicide in the forest does give the film a little something that many do not have–a direct connection to the horrific reality of a place that anyone can visit on their trip to Mount Fuji. After talking with my expatriate friend who resides in Japan, I do look at this film a little different since the narrative appears to hit very close to home for many who live with news of the dark side of that forest as part of their lives. For what it’s worth, it’s a fun movie to watch if you are looking for some cheap scares. Like with most horror films, it is best enjoyed or appreciated in a group setting. That’s probably how I’m going to see it: in a group setting with a couple of beers. Your review was very well written, but I’m not sure whether to see this movie. I’ll contemplate seeing it so I can give my opinions on it.